This sturdy RV Lavatory Faucet is the perfect replacement for your home on the road. Enjoy the peace-of-mind that comes with buying a Dura Faucet. Our RV shower accessories are manufactured using heavy duty material which means years of uninterrupted use. Featuring a dazzling Brushed Satin Nickel, Venetian Bronze, or Chrome finish, our wide selection of shower accessories will make a great for a great upgrade to your home on the road. Easy installation and UPC/CUPC certification. FEATURES | This faucet boasts a crisp and clean finish, and comes with a single-lever to adjust temperature and water pressure. And there will be no splashing with the aerated stream. DESIGN | The classic arc-styling of this faucet is the perfect solution for updating your sink hardware. Heavy-duty commercial metallic construction keeps the unit firmly in place on the sink. 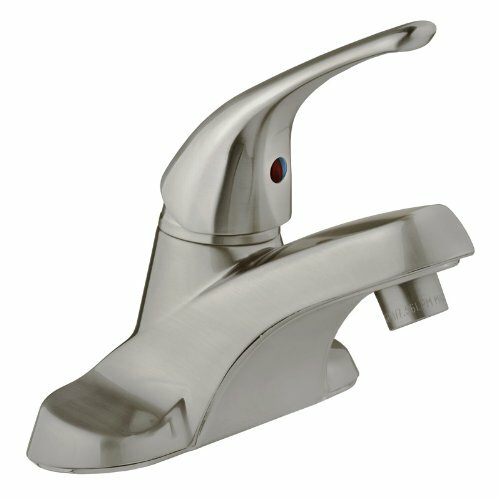 QUALITY | This faucet handle provides a smooth turning action, while preventing unwanted dripping. Update your sink quickly and easily with this quality faucet. This model is lead-free. SPECIFICATIONS | Works on any 2-hole sink opening. Solid zinc lever with brass inlet tubes. Flow rate is 2.2 gpm. UPC and CUPC Certified. Total length is 6", width is 6", and 10" high.